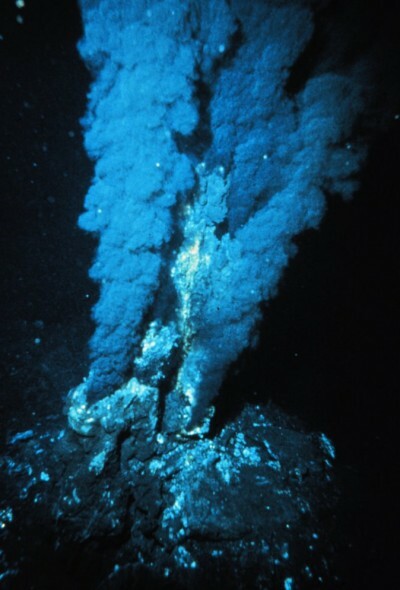 The deep sea (or hydrothermal) vent theory for the origin of life on Earth posits that life may have begun at submarine hydrothermal vents, where hydrogen-rich fluids emerged from below the sea floor and merged with carbon dioxide-rich ocean water. Recent research has found prolific life (known as “thermophiles” or “extremophiles”) developing around “black smoker chimneys” at submerged openings in the Earth's crust, in mineral-rich water as hot as 400°C. Geologists have also discovered 1.43 billion year old fossils of deep-sea microbes around very similar fossilized chimneys, providing evidence that life may have originated on the bottom of the ocean, protected from harmful ultra-violet light, and not in shallow seas as the Australia stromatolite fossils suggest. According to another recent theory, Zachary Adam of the University of Washington has hypothesized that stronger tidal processes from a much closer Moon may have concentrated grains of uranium and other radioactive elements at the high water mark on primordial beaches. These elements are capable of self-sustaining nuclear reactions and may have provided sufficient energy to generate organic molecules, such as amino acids and sugars, from acetonitrile in the water, as well as releasing soluble phosphate (with which they could react and possibly generate the building blocks of life). The active system of plate tectonics on the early Earth would also have helped to bring radioactive minerals to the surface. In the 1970s, the Austrian astrophysicist Thomas Gold proposed the theory that life first developed, not on the surface of the Earth, but several kilometers below the surface, well protected from the extremely inhospitable early atmospheric conditions. The discovery in the late 1990s of “nanobes” (filamental structures that are smaller than bacteria, but that may contain DNA) in deep rocks might be seen as lending support to Gold's theory. Although these deep microbes would have needed a source of food, it is possible that this could have been provided by the out-gassing of primordial methane from the Earth's mantle, or by hydrogen released by an interaction between water and iron compounds in rocks. However, some bacteria have been found in rocks a kilometer underground, slowly digesting organic material without the aid of oxygen and dividing only once every thousand years or so. Other bacteria have been found that can live in sulphuric acid or even in nuclear waste, suggesting that our assumptions about the necessary conditions for life may be much too narrow. Recent research in California by evolutionary geobiochemist Felisa Wolfe-Simon has identified bacteria that thrives on arsenic, an element hitherto considered entirely poisonous to anything we think of as life, and that even incorporates arsenic into its DNA in place of phosphorus. These discoveries raise the tantalizing possibility that Earth may in fact harbor more than one "tree of life" (what Paul Davies calls "shadow biospheres"), and that life on Earth may have developed not once but perhaps many times. It also increases the likelihood that life has developed elsewhere, and that our assumptions about the necessary pre-conditions for the establishment of life may be too narrow. There are several other alternative terrestrial theories, with more or less support in the scientific community, including the “iron-sulphur world” theory, the “lipid world” theory, the “PAH world” theory, the "clay" theory, the “autocatalysis” theory, etc.